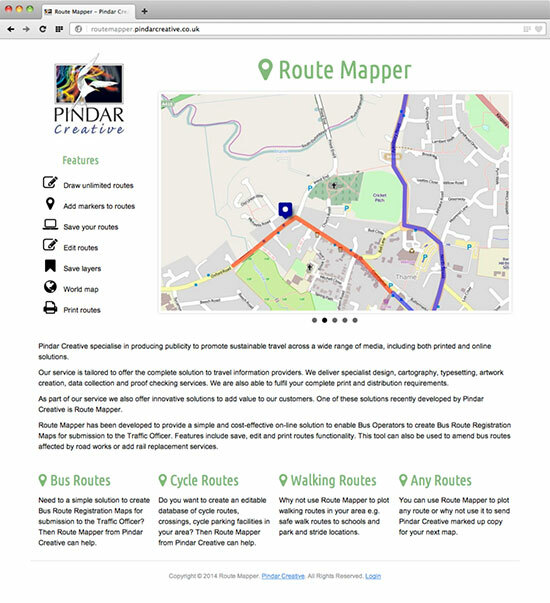 Pindar Creative has developed 'Route Mapper' a tool to provide a simple and cost-effective on-line solution to create bus route registration maps. This tool is designer for Bus Operators or Local Authority who need to create bus route maps for submission to the Traffic Officer or to tender bus services. This tool can also be used to amend bus routes affected by road works or add rail replacement services. Route Mapper can also be used to create an editable database of cycle and walking routes, crossing, cycle parking facilities, safe walk routes to schools and park and stride locations and much more.